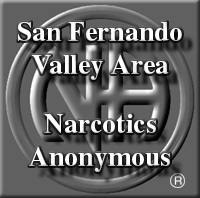 NeverAlone Newsletter is published by the San Fernando Valley Area Service Committee of Narcotics Anonymous®. It is distributed free to our groups and made available on our literature tables to further our primary purpose: To carry the message to the addict who still suffers. If you are interested in joining the Newsletter Subcommittee, please send email to: sfvneveralone [at] nasfv [dot] com.